Protect your collection of antique tea cups or your favorite china dolls in the Amish Double Door Picture Frame Deluxe Curio Cabinet. This beautiful display case is right at home in your dining room or living room, or standing in your entryway or foyer. 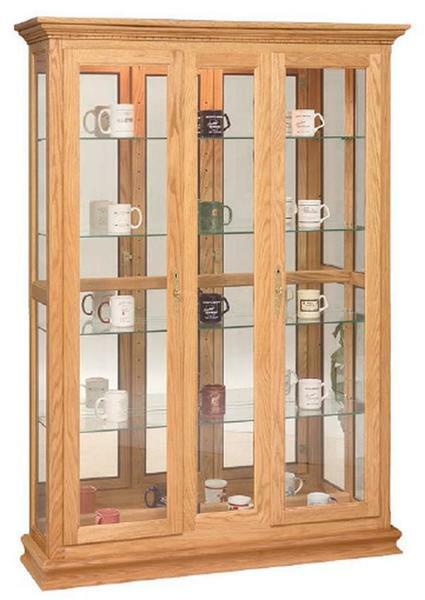 Dust will not collect on your precious items that are highlighted in this glass curio cabinet. Revisit the memories of your collection with this Amish curio cabinet to preserve them. The glass shelves can hold up to 70 pounds and have plate grooves to display treasured china. Take a look at our blog post, "Curio Cabinet of Curiosities," for creative ideas using your solid wood curio cabinet. Call one of our Amish Furniture Specialists today, toll-free at 866-272-6773 with any questions. Glass shelves can hold up to 70 lbs. The shelves are 10 5/8" by 46 1/4" and 1/4"thick. I have attached the pictures of the wheelbarrow with the picture of my 2 dogs, Gizmo and Billie Bo. I will send more pictures later of the smaller wheelbarrow as well with the beautiful mare and foal. The artist truly captured both my dogs. Gizmo is always sniffing the flowers and Billie Bo loves his t-shirts and sweaters. Words can't express my happiness at the way my dogs were portrayed and my gratitude to the artist. Thanks to him my dogs will live forever in a way. He made a wheelbarrow into a family heirloom. this is to show off many thoushand's of dollars of 100 year old glass items!